Along with its unique direct drive transmission which allows it to accelerate to its top speed without gearchanges, the Koenigsegg Regera also employs carbon-fibre construction for its wheels. 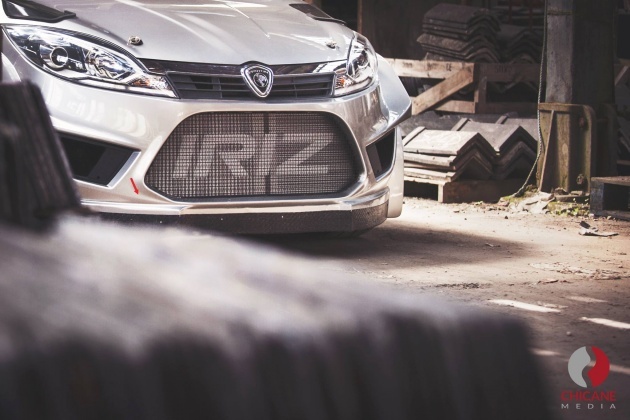 In this video, /DRIVE shines its spotlight on Koenigsegg, with particular focus on the Regera’s wheels. Now although it isn’t the first car to use factory-fit carbon-fibre wheels – that accolade goes to another Koenigsegg, the One:1 – the new wheel design for use on the Regera adds an aesthetic element, with styling that would be unfeasible on a wheel of traditional aluminium construction – it would be either too heavy or not strong enough, according to founder Christian von Koenigsegg. To recap, the Koenigsegg Regera is powered by a 5.0 litre, twin-turbo V8 and three electric motors producing a total system output of over 1,500 hp and more than 2,000 Nm of torque; sufficient to propel the Regera to a string of impressive acceleration figures: 0-100 km/h in 2.8 seconds, 0-200 km/h in 6.6 seconds, 0-300 km/h in 10.9 seconds and 0-400 km/h in 20 seconds. With the launch of the 2017 Honda CBR1000RR at Intermot in September 2016, Honda has very clearly signalled its intention to contest the World Superbike Championship crown, and wrest it away from current title holders Kawasaki. The attempt takes the form of the Honda CBR1000RR SP2, a track oriented version of the road-going CBR1000RR SP road-going superbike. Carrying a 999 cc inline-four that puts out a claimed 189 hp at 13,000 rpm and 116 Nm of torque at 11,000 rpm in SP form, the CBR1000RR is the seventh generation in a line of fire-breathing Fireblades going back to 1992, to the original CBR900RR. 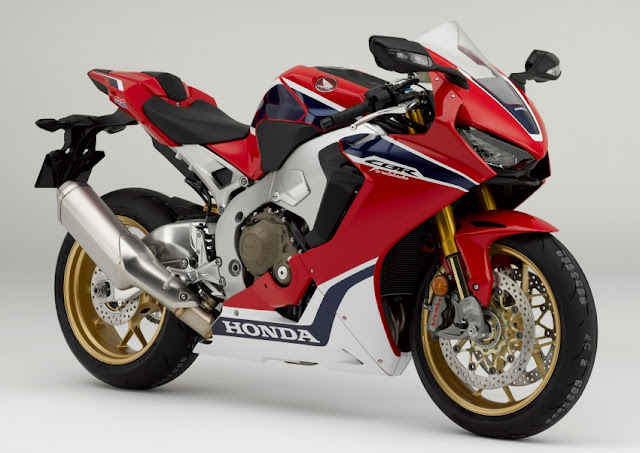 The new Honda superbike has also undergone a serious weight reduction programme, now weighing in at 195 kg wet – 16 kg less than the previous model. 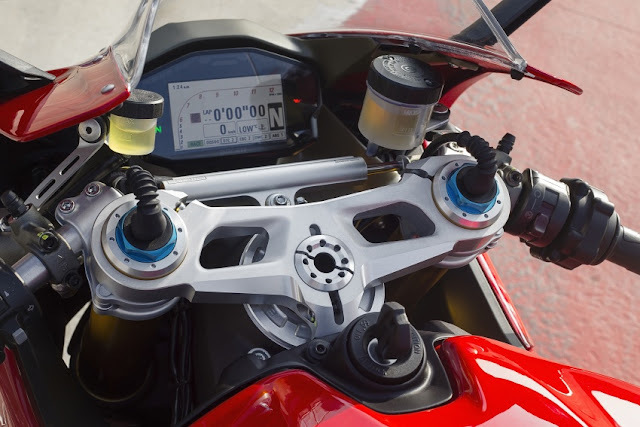 The new CBR1000RR also comes with a full suite of electronic riding aids, including nine-level Honda Selectable Torque Control (HSTC), Selectable Engine Brake (SEB) and Riding Mode Select System (RMSS). 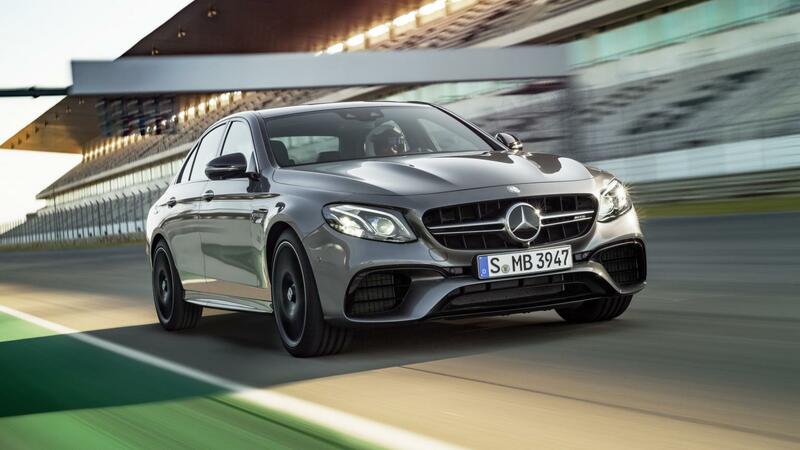 A quickshifter is standard, and three settings for the downshift assist that works in conjunction with the ride-by-wire auto-blipping. On the CBR1000RR Fireblade SP2, the cylinder head is installed with larger valves, with narrower included valve angles but identical valve pitch to the SP, to retain cylinder head dimensions. The spark plugs are longer, with an optimised combustion chamber shape derived from the RC213-V MotoGP race bike. 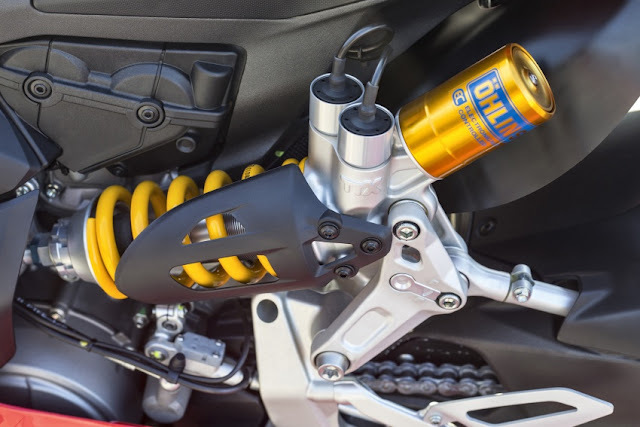 Ohlins performs the suspension work on the CBR1000RR, with an Ohlins Smart-EC, or semi-active, suspension. The front fork is a 43 mm NIX30 Smart-EC fully-adjustable unit, while the rear is suspended by a TTX36 Smart-EC absorber, also fully-adjustable. Assen GP winner Jack Miller (Estrella Galicia 0,0 Marc VDS) was back on fighting form after getting back to near full strength for his home GP at Phillip Island, the the Australian qualified in a career best fifth in a difficult Q2, before going on to battle inside the top ten – and take P10 by the end of the seven rider scrap. Miller had also gambled on tyres after the only dry track time of the weekend proved to be the extended Warm Up session, and raced his hard compound front tyre into the unknown, having had no time to try the option before lights out. One tangle with Repsol Honda Team’s Nicky Hayden saw the American slide out at Turn 4, but Miller is happy with decent points and a good finish. Jack Miller (P10): “I think that’s what you call a heavy battle! It was an intense race and I enjoyed it. It got a bit scary at times because you have no idea who is going to lunge up the inside from one corner to the next. Going into Doohan Corner at over 330kph it was getting a bit crazy because it was a case of who dared brake the latest. It was a lot of fun and good to have a good old-fashioned scrap because it helped me learn a lot. The important thing was to finish with some decent points and I did that. I also think the home fans could see how determined I was to put on a good show for them and they definitely got good value for money from us. I felt I could have been in a better position after qualifying in fifth but I got a bit messed up on the last lap. I took a risk to race the hard front Michelin tyre and I’d not done one flying lap with that option before the lights went out. But it was the rear tyre that was causing me a few issues because I had a few moments. I was losing the rear on entry and ran wide a few times but I’m happy with a top 10." 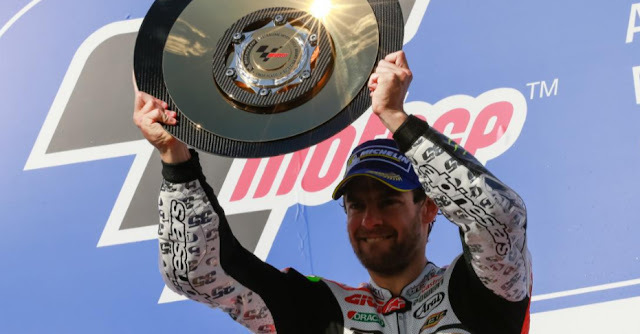 Cal Crutchlow (LCR Honda) took a stunning second career victory in the Australian GP, after having lost a podium at the track in 2014 under similar circumstances – back then following race leader Marc Marquez (Repsol Honda Team) into the gravel. 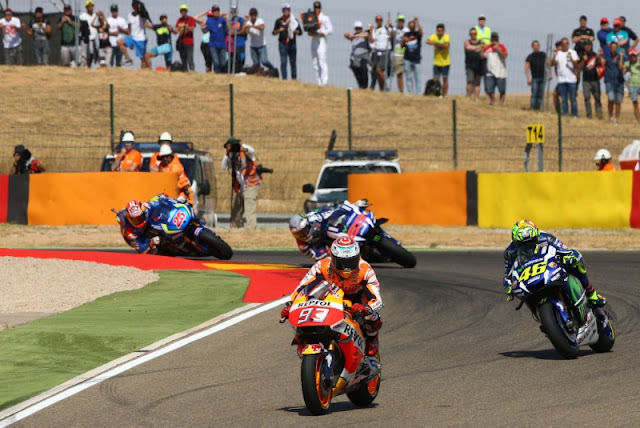 In 2016 however, it was only Marquez who repeated the error, braking too deep into Turn 4 and folding the front – leaving Crutchlow to keep his stunning race pace up and take career victory number two; a chasing Valentino Rossi (Movistar Yamaha MotoGP) unable to catch the Brit. Cal Crutchlow (P1): “I’m really pleased to come here and race in the conditions we raced in. It was about keeping your head throughout the weekend, and we know some of the conditions were dangerous. My pace here was better than in other years, and I was pleased to be able to take advantage when I needed to take advantage. I need to thank my team for all their work this weekend and also Honda, because they help us a lot internally. I’m disappointed my two girls aren’t here today but they’re already on the flight to Malaysia – so when they land they’ll see that I’ve won! “If Marc had crashed in turn 6 I would have thought nothing of it, but I crashed there two years ago with a big gap. So I spent the rest of the race thinking it was a disaster. I pushed in the laps when the sun wasn’t out, because I knew I had to keep the heat in the front tyres. I was in a good rhythm. I saw the pit board said 1.2 to Vale and I thought “please he’s not coming from 15th…” Then it started to go up and honestly then you don’t know what to do because you want to continue to push. But I had some flashbacks from a couple of years ago, there’s no doubt about that. arc Marquez (Repsol Honda Team) had a perfect scorecard in 2016 until the Michelin® Australian Motorcycle Grand Prix. Taking the lead back from fast starter Pol Espargaro (Monster Yamaha Tech 3), the polesitter disappeared into the distance – until a mistake braking too deep into Turn 4 saw him crashing out of contention. Also suffering a crash in Le Mans but able to remount and take points, the Australian GP is Marquez’ first zero of the year – but with the title already wrapped up in Motegi after both Movistar Yamahas saw the same fate there, the mistake was a less expensive one than it could have been. Marc Marquez (DNF): "First of all I want to say sorry to my team because I made a mistake today. We were doing everything perfectly, and we were just missing capping it with a result on Sunday. If I had been fighting for the title it would’ve been an entirely different race, as I wouldn’t have risked so much. Today I started strong because I knew I had to make a difference at the beginning. I was maintaining the distance, but at one of the hard braking points I braked too late and instead of taking a wider line, which is what I had been doing throughout the year, I tried to keep going. In such cases the limit is a fine one. We remain happy of course because we had already won the title but of course we wanted to win more races. It was completely my mistake; during the whole season I’ve been very careful on the braking points and this time I risked more so this crash has nothing to do with the Michelin tyres. Now we have another race next week, and we’ll just think about that. Congratulations to Cal for his great victory". Model sports Ducati ditawarkan kepada pengguna dengan nama Panigale dan model pertengahannya, Panigale 959 tiba di Malaysia dengan harga RM99,999 (termasuk insurans, tanpa GST). Gaya yang digunakan menyerupai model lebih tinggi iaitu Panigale 1299, bersama lampu tajam di hadapan dan lampu belakang yang unik. 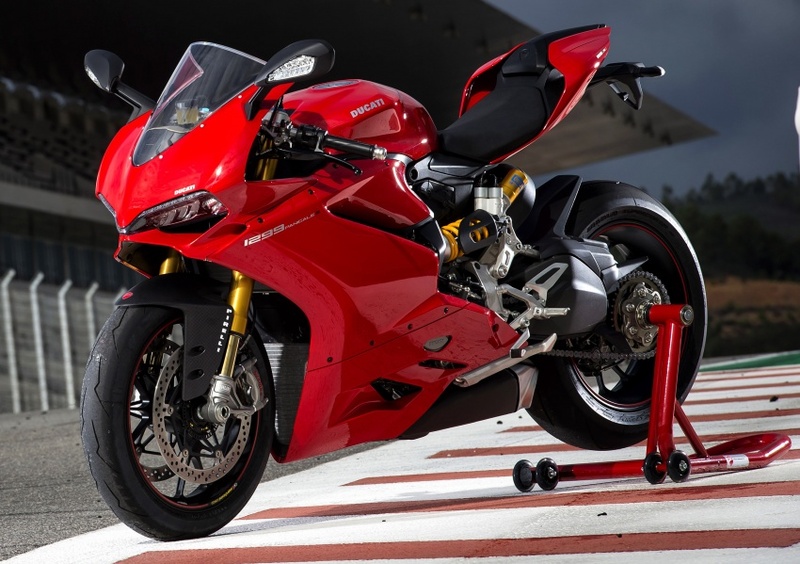 Model ini adalah penyambung kepada model Panigale 899 yang ditawarkan sebelum ini dan ia menggunakan enjin Superquadro dua silinder sama, cuma diubah suai pada bahagian strok untuk menjadikan kapasitinya 955 cc. Dengan perubahan ini, tork yang lebih meluas pada tahap rpm berbeza dapat dihasilkan, dan bersama jumlah kuasa 157 hp yang meningkat, ia masih tidak perlu tempoh servis yang pendek. Pelarasan injap hanya perlu dilakukan pada setiap 24,000 km. 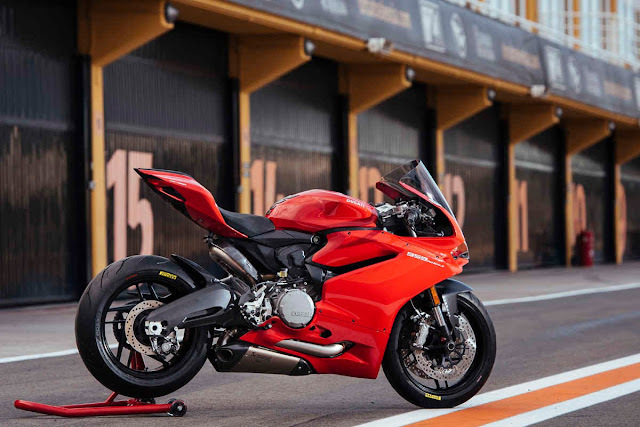 Dibangunkan sebagai sebuah model serba boleh, Panigale 959 dilengkapi dengan tiga pilihan mod tunggangan, sistem brek ABS Bosch tiga tahap, Ducati Traction Control (DTC), Engine Braking Control (EBC) dan Ducati Quick Shift. Pilihan warna yang disediakan adalah merah dengan rim hitam dan putih dengan rim merah. Valentino Rossi will aim to pick himself up again this weekend at Phillip Island in Australia after his misfortune at Motegi was another low point in the Italian's 'worst season on paper'. Rossi saw his slim hopes of clinching the MotoGP World Championship ended when he slid out of contention while holding second place. The Movistar Yamaha rider had started the race from pole and was chasing after Marc Marquez when disaster struck, with Repsol Honda Marquez confirmed as the champion with three rounds to go when Jorge Lorenzo also suffered a shock fall in Japan. Rossi remains locked in battle for second place in the final standings with Lorenzo heading into Phillip Island, with the pair separated by 14 points. “The bad thing is that we took zero points in Motegi, but the good thing is that we showed that we are strong. Phillip Island is a fantastic track and a place that I like a lot. 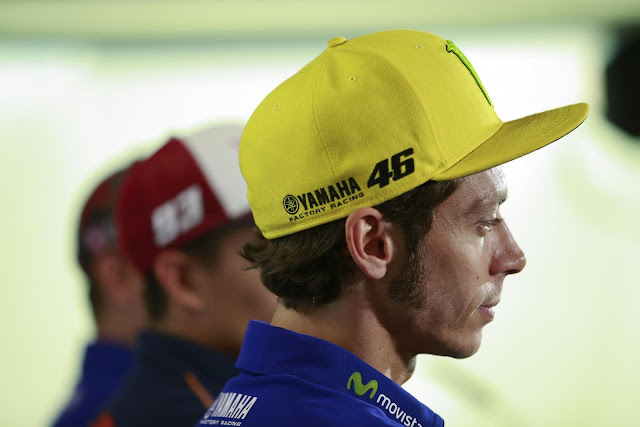 We have to try to be fast and strong there too,” Rossi said. Rossi has a terrific record at Phillip Island, where he dominated during a five-year winning streak from 2001 to 2005, followed by five more consecutive podium finishes in the premier class, taking second place in 2008 and 2009 and three thirds in 2006, 2007 and 2010. 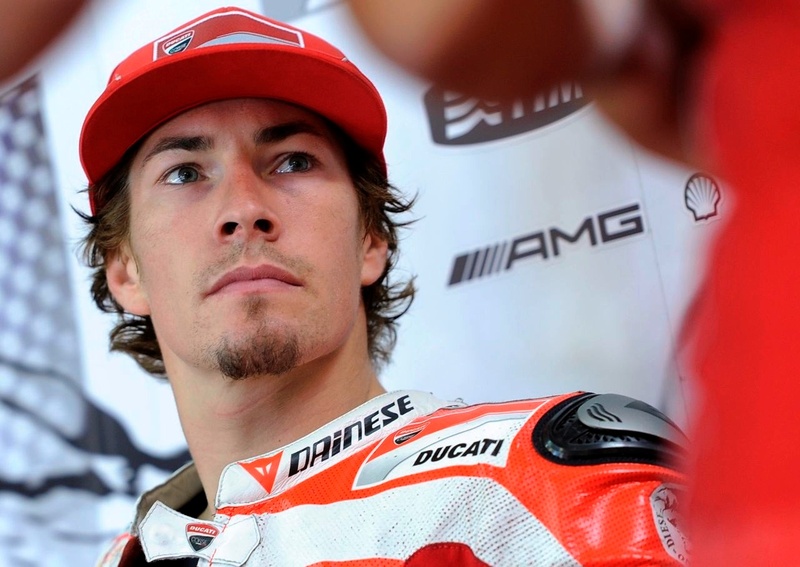 Former MotoGP world champion Nicky Hayden will replace the injured Dani Pedrosa in the Repsol Honda team at Phillip Island. Pedrosa is recovering after sustaining a broken collarbone in a huge high-side during practice for the Japanese Grand Prix at Motegi. Honda World Superbike rider Hayden, who filled in for Jack Miller at Aragon in the Marc VDS team, says he is delighted to have the chance to return to 'my old dream team'. Hayden began his MotoGP career at Repsol Honda in 2003, going on to claim three wins, 25 podiums and the 2006 world title during six seasons at the squad. 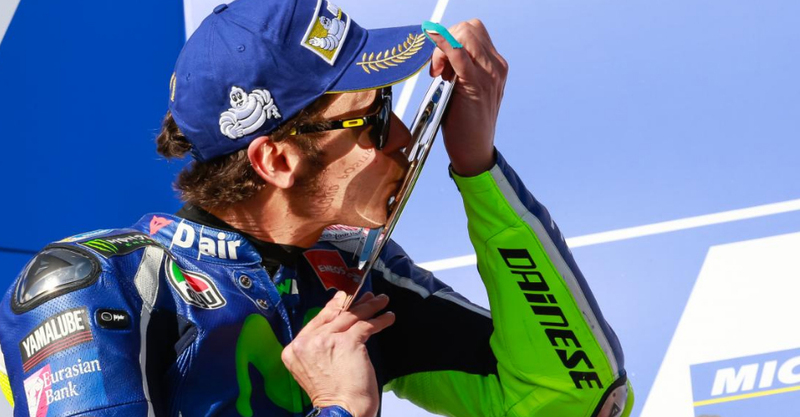 He is also something of a specialist at Phillip Island with three podiums, two poles and a fastest lap. “First of all my best wishes to Dani, I'm sure he will come back stronger than ever like he always does,” Hayden said. “For me it's crazy hard work but it's a chance, ten-years after winning my World title, to get back to my old dream team! “Doing a weekend in Phillip Island on a factory Honda, it's pretty emotional for me to even think about it and I'm very grateful for this opportunity and the trust that Honda gives me. "I want also to thank my current team for allowing me to go and do this and the sponsors. “Everybody worked a lot on every detail to make it possible for me, so now I'm excited to get on a plane, get down to Phillip Island and hopefully I can do a good job for the team,” he added. Meanwhile, Pedrosa has left the Universitari Dexeus Hospital, where he underwent successful surgery to his right collarbone last Saturday. He will have a follow-up appointment with his doctors on Wednesday. HRC test rider and former 250cc world champion Hiroshi Aoyama replaced Pedrosa for the remainder of the Motegi weekend, qualifying last and finishing 15th in the race. Marc Marquez says the intense pressure he felt to reclaim the MotoGP World Championship this year weighed heavily on his shoulders in the first half of the season. Marquez was struggling to get the most from his Repsol Honda after the switch to Michelin tyres and a new control ECU. 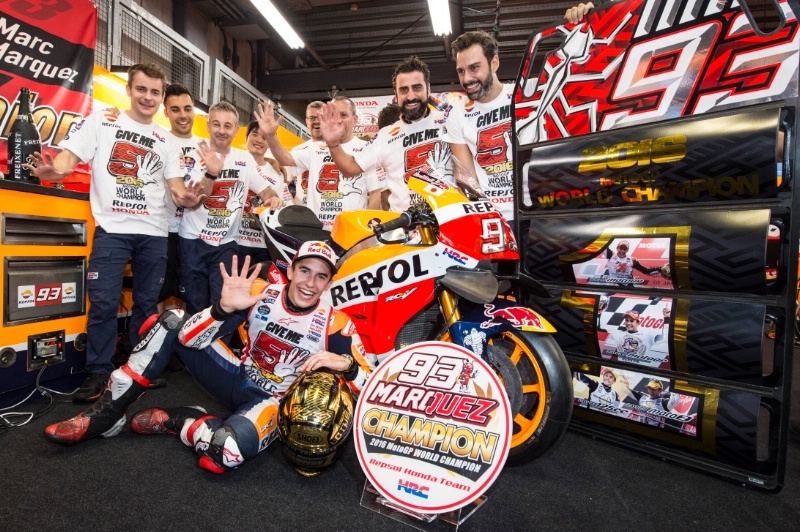 The 23-year-old admits that the fun went out of MotoGP for a while but with the support of his team, Marquez worked through the issues and soon rediscovered the winning feeling to resurrect a championship challenge. “Every year is really hard and every year you do your maximum, but especially this year the pressure that I felt, especially in the beginning of the season was really high. Last year we did a few mistakes and I don't like to finish the championship like last year,” he said. “This championship was hard and I feel more pressure, but also more motivation. This combination kept me really focused and concentrated and from Thursday to the race I was just focused on the bike and focused on my team and this was the key. “In 2013 I didn't feel the pressure but this championship I cannot explain the pressure – it is something that I maybe didn't understand before this year. I felt it this year and even my team said sometimes, 'Marc, smile – you are not the same Marc and you must enjoy'. “Sometimes I forgot to enjoy because the pressure is so high but the key is to enjoy, especially when I arrived with the first and second victories and then this pressure cooled down,” added Marquez. Marquez says he learned to be more calculated in his approach to the championship this year, opting to find the limit of the RCV in practice before treading more carefully in the races. “This championship is really important because in 2013 and 2014 I didn't expect, but okay I win. Maybe a real champion is when you can take the pressure and last year I learn that maybe the approach of the races, the consistent, is very important too. With a healthy advantage of 52 points heading into the Japanese Grand Prix, Marquez says he was unusually relaxed prior to the start of the race because he didn't expect to wrap up the title until at least the next round at Phillip Island in Australia. “I felt normal today and I did the breakfast at the same time, went to the toilet at the same time – always I do the same. Normally when you are more nervous you go on the toilet more times! I kept quiet and I felt relaxed,” he said. “When I was riding and there remained five laps or six laps, I started thinking, 'okay, in Australia I need to finish seventh or eighth to be world champion. Then when I saw Lorenzo out, everything became crazy in my head. “I did a few mistakes but the key point is that in the beginning of the race I was really quiet. Then when Valentino overtook me three or four times, he braked too deep and went wide, so I didn't want this battle and I said I need to go. I overtook him and I pushed for five or six laps and then it was enough because he did the mistake and I tried to manage the difference to Jorge,” Marquez added. Valentino Rossi's race and world championship hopes ended with a fall from second place in Sunday's Japanese MotoGP. The Italian, who had qualified on pole, overtook Movistar Yamaha team-mate Jorge Lorenzo a lap earlier and was pushing hard to try and catch leader Marc Marquez. But Rossi's front wheel folded at the slow hairpin on lap 7 of 24, sending the Doctor sliding into the gravel and leaving him to ponder a fourth non-score of the season. "First of all, I would like to say that I'm OK, fortunately no problems," said Rossi, who was momentarily trapped under his bike, "On the other hand it's a shame, because I was quite strong and I had a good pace. 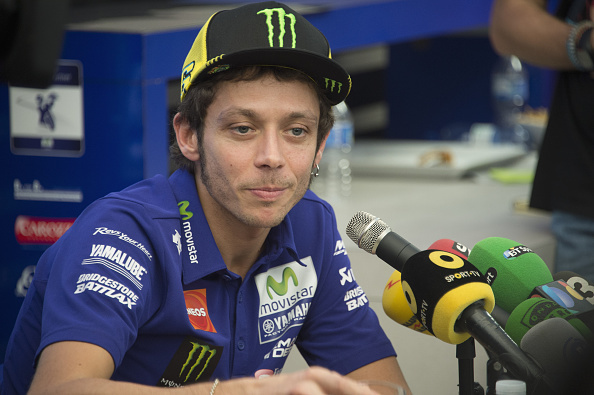 "Unfortunately my start was not fantastic and I lost positions to Marquez and Lorenzo. After that, Marquez was a bit faster than me to overtake Lorenzo, I lost a bit more time behind Lorenzo, but the pace was good. "I was able to push a lot to try and catch Marquez but unfortunately I lost the front. Sincerely, I felt nothing - not too fast, too wide or too deep - but I lost the front and logically I made a mistake." Rossi and Lorenzo - like most of the grid - chose the medium front and soft rear tyre combination. 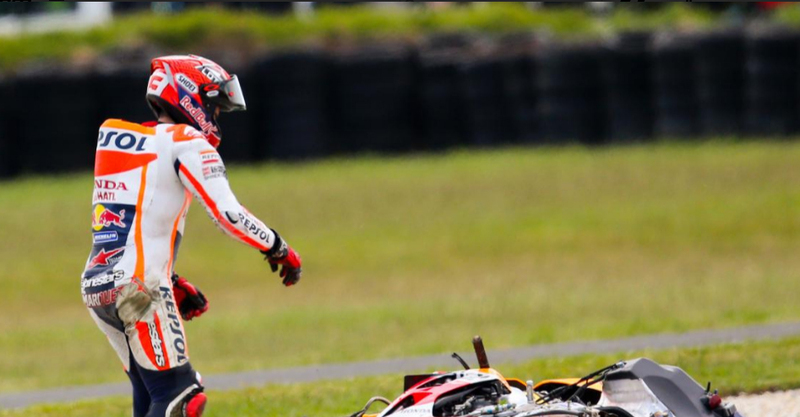 When Lorenzo also fell, in the closing stages, it confirmed Marquez as champion with three races still to go. Andrea Iannone is to miss the MotoGP round at Motegi. The Italian has been advised by his doctors to skip the first of the three Pacific flyaway rounds to allow the vertebra he fractured at Misano to heal. Iannone picked up the injury on the first day of his home race at Misano. Though the injury is on the forward side of the T3 vertebra, making it less vulnerable to a repeat injury, the fracture has caused him to miss both Misano and Aragon. Motegi will be the third race which Iannone will be forced to miss. The factory Ducati team will not field a replacement for Iannone. The decision came as late as possible for the factory, to give Iannone as much time as possible to be fit in time for the Japanese race. That has not been possible, but doctors are confident that Iannone will be fit to race in Phillip Island, the second of the three flyaways. 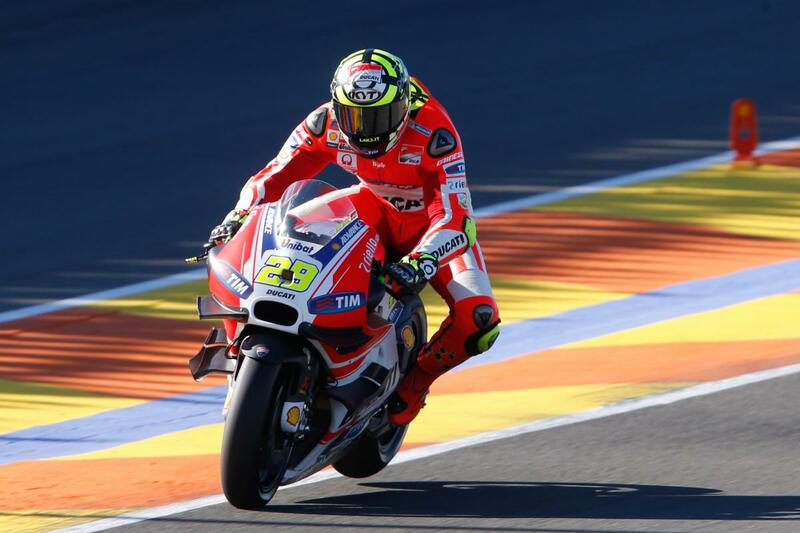 Given that Iannone had such a strong race there in 2015, ending on the podium after a four-way dice with Marc Marquez, Jorge Lorenzo and Valentino Rossi, he will be keen to race in Australia, in the hope of pulling off a repeat. Andrea Iannone will not be taking part in the Grand Prix of Japan, which will be held this coming weekend at Motegi’s Twin Ring circuit. Last week the Ducati Team’s Italian rider underwent a series of checks, which showed that the excess fluid in his back injury had been almost totally absorbed and that the calcification process of the T3 vertebra, which he fractured at Misano after crashing during the first free practice session for the San Marino GP, was now well underway. However Iannone’s doctor has advised him to continue with his rehabilitation and to wait a few more days until the fracture has completely healed, before going out onto the track once again. The rider from Vasto, in agreement with his team, has therefore decided not to take part in the GP of Japan and to return to the championship at the Australian GP from 21 to 23 October. Last year, at Phillip Island, Iannone was the protagonist of a spectacular race, finishing on the podium in third place. The legal oddity that riders' contracts are out of sync with the MotoGP season creates an uncomfortable truce among the factories. When riders sign with a factory, their contracts run from 1st January to 31st December. But for the factories and teams, the new season starts on the Tuesday after the last race of the year, at Valencia. This is a particular problem for the 2017 season, with so many riders changing factories. Traditionally, there has been a gentlemen's agreement among the factories to allow the riders to test with their new team, despite still being under contract to the old one. So in previous years, the likes of Valentino Rossi (twice) and Casey Stoner have lapped Valencia aboard their new steeds dressed in plain leathers. The plain leathers are just one side of the compromise. As a rule, the riders switching factories are not allowed to speak to the media, or only allowed to speak in the most general of terms, avoiding direct comparison between their new bikes and their old bikes. The riders continue to perform PR duties for their old factories up until the end of the contract deadline. More importantly, however, it is so that the teams and factories can actually benefit from the results of their riders from that season. When Valentino Rossi left Yamaha to join Ducati at the end of the 2010 season, Yamaha had won the team and manufacturers' title, along with Jorge Lorenzo's riders' championship. Yamaha needed promotional material to celebrate both the team and the manufacturers' title, which included shooting and publishing photographs with Valentino Rossi directly after the end of the season. That material was then used in promotional materials for the rest of the year. If Rossi's contract had ended on the Sunday night after the final race, they would not have been able to do that. As a Ducati rider, there would have been complicated issues over image rights, and Rossi could not have appeared at sponsor events to celebrate Yamaha's success. Despite the awkwardness of the formal contract situation, factories tend to be lenient when riders leave for pastures new. This is only in part down to magnanimity: there is a healthy dose of self interest involved too. Factories are caught in a form of prisoner's dilemma: they know that if they refuse a departing rider permission to test with their new factory, there is a very good chance that the other factory will do exactly the same to them at some point in the future. So when factories do refuse permission to test, it is seen as a remarkable move. That has only happened once in the recent past: when Valentino Rossi left Honda to join Yamaha at the end of the 2003 season. HRC felt they had some justification in denying Rossi the opportunity to test: Rossi only informed them that he was leaving at the Motegi round in October of 2003, after months of tortuous negotiations. It was also the first time in a very long time that anyone had had the temerity to turn down Honda. Especially someone with the stature of Valentino Rossi. 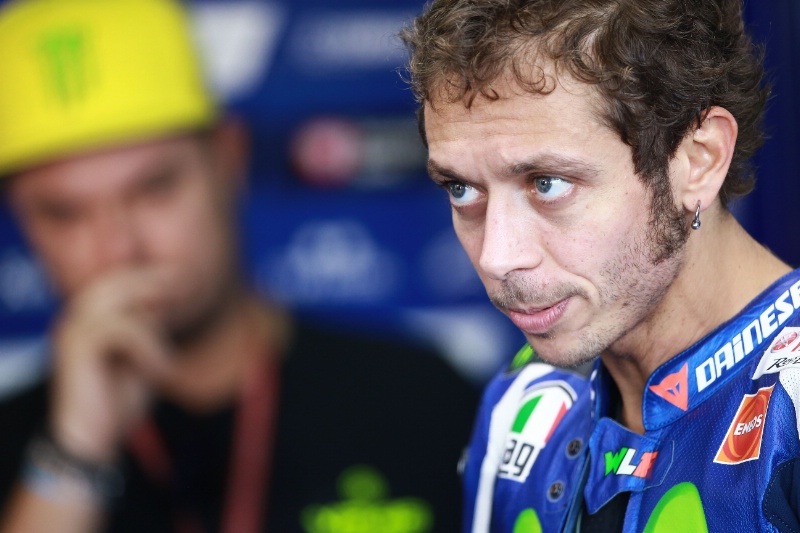 Rossi was held to his contract, and not allowed to test until after 31st December 2003.
. According to reports in the Italian sports daily Gazzetta dello Sport, Yamaha have given Lorenzo permission to test with Ducati at Valencia, but not at a private test Ducati have planned for Jerez later in November. Lorenzo will have to wait until the first official test of 2017, at Sepang at the end of January before he climbs back on board the Ducati Desmosedici GP17. Why would they do this? That is difficult to say, and a question it is pointless to ask, as you are (understandably) unlikely to get a straight answer. A case could be made – and Yamaha will doubtless make it – that allowing Lorenzo to ride the Ducati at Valencia honors the unspoken agreement MotoGP's factories have. When Casey Stoner switch to Honda in 2011, he tested only at Valencia, as did Valentino Rossi the same year he went to Ducati. 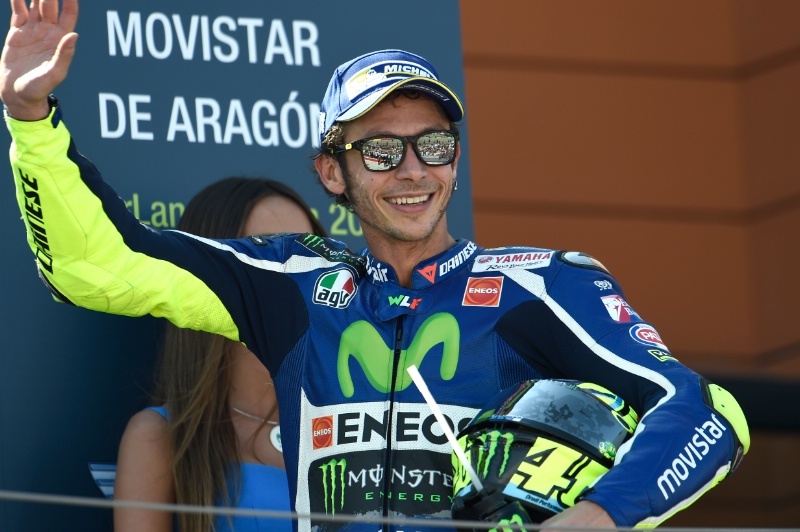 Similarly, when Rossi returned to Yamaha at the end of 2012, the Italian only tested at Valencia. This is a slightly disingenuous argument, however. Testing regulations were much stricter for the 2011 season, meaning there was less opportunity for either Rossi or Stoner to test. What's more, directly after the Valencia test, Rossi had surgery on the shoulder he injured at the start of the 2010 season, meaning he was unable to ride a bike after Valencia, even if he had wanted to. Though testing regulations had been eased somewhat at the end of 2012, Yamaha had no tests planned after Valencia that year, meaning that Rossi did not have the opportunity to test, even if he had wanted to. Things are different in 2016. With five days of private testing allowed for each season, in addition to the official tests, Ducati are free to organize tests with the factory riders in November. Given that the most important period for Ducati is immediately after Valencia and the run up to the winter test ban, they have scheduled a private test at Jerez for 23-24 November. They had hoped to both allow Lorenzo to further familiarize himself with the first version of the GP17, and get his feedback on the bike before the winter test ban kicks in. 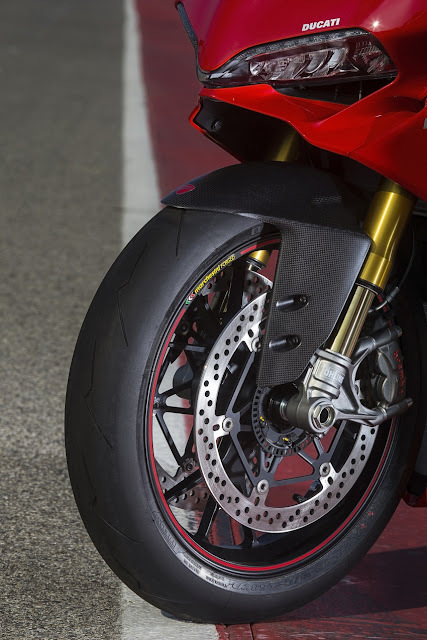 Ducati would then be able to incorporate his feedback into the next version of the GP17 to be rolled out at Sepang.
. That, incidentally, is the reason Pirro is not substituting for Andrea Iannone at Motegi, who has decided to skip the first of the three flyaways to give his injured T3 vertebra a little more time to heal. 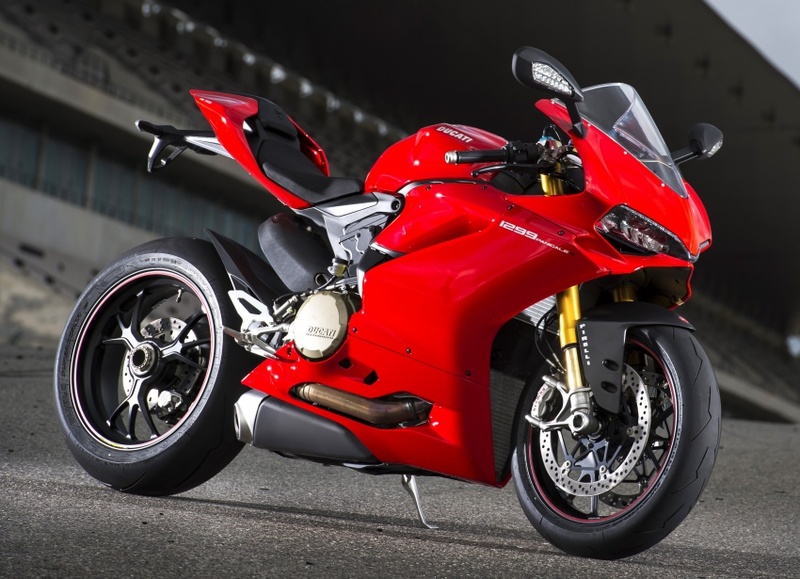 , despite being asked by Ducati. Though Stoner remains an enigma, this decision is further confirmation that he is done with racing and has no desire to come back, even for a wildcard or a replacement. Yamaha's decision to refuse Lorenzo permission to test beyond Valencia looks even more suspect in light of Ducati and Suzuki allowing Andrea Iannone and Maverick Viñales to test for Suzuki and Yamaha respectively. Viñales will ride the Yamaha M1 alongside Valentino Rossi at Valencia, then again later in the month at a private test in Sepang. Iannone will also ride at Valencia, and either at Jerez or Sepang, depending on where Suzuki decide to test. So why would Yamaha limit Lorenzo's testing to just two days at Valencia, preventing him from riding the bike at Jerez later in November? There are two plausible explanations. Either Yamaha fear Lorenzo will be quick from the off on the Ducati, and they want to keep him off the bike for as long as possible. 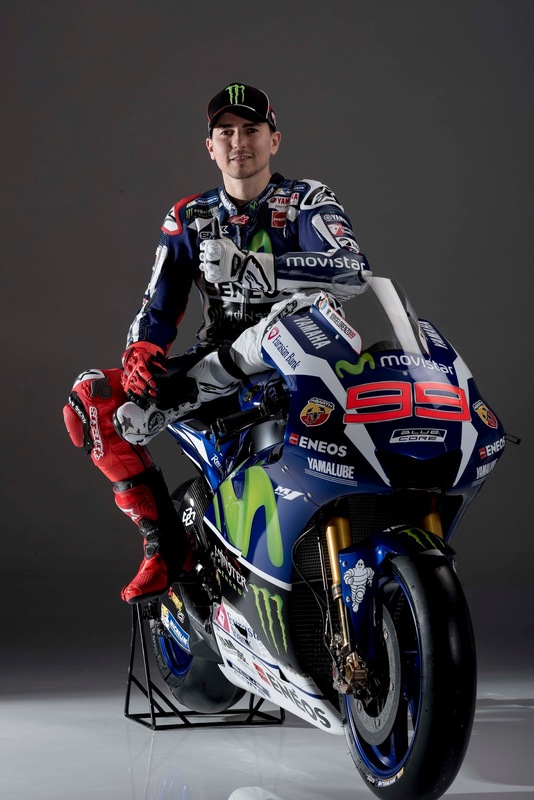 Or the relationship between Yamaha and Lorenzo has deteriorated so badly that Yamaha do not want to allow him to test. To start with the latter theory, it is entirely possible. Relations have been strained between Yamaha and Lorenzo since the end of the 2015 season, when Yamaha found themselves in the impossible situation of having to deal with Valentino Rossi accusing Marc Márquez of conspiring against him to hand the title to Jorge Lorenzo. Yamaha's poor handling of that situation left Lorenzo feeling bitter, and with relations soured between their two riders. Lorenzo then made a difficult situation much worse by first demanding that Yamaha offer him a contract before the start of the season, so that he could start the year with his future secured. Yamaha complied with his request – scrupulously offering both their riders a contract simultaneously, attempting to avoid any semblance of favoritism. Lorenzo then prevaricated, and tried to use Ducati's offer as a bargaining tool. Yamaha held firm, and Lorenzo decided to walk. Already poor relations were made even worse. Alternatively, Yamaha could just be afraid of Jorge Lorenzo on a Ducati. The Japanese factory are all too aware of the talent of the Spaniard: Lorenzo has been with them since 2008, and has won three MotoGP titles for them. Yamaha invested a lot of effort in Lorenzo, signing him to a MotoGP contract very early, with papers signed in 2006, a whole season before Lorenzo ascended to the premier class. Yamaha signed Lorenzo knowing full well that it would raise the ire of Valentino Rossi, a move which eventually led to Rossi departing for Ducati. Will Lorenzo adapt quickly to the Ducati? There are many in the paddock, including current and former riders, who believe he will. Adaptability – to machinery at least – has been the signature of Lorenzo, having battled poor bikes throughout his time in 125s and 250s. Even in MotoGP, Lorenzo has been consistently competitive, even when the Yamaha has been a little off the pace. His weakness has come with tire changes: without grip at the very edge of the tires, the Spaniard has struggled. The true reason behind Yamaha's refusal probably lies somewhere in between. Yamaha rightly fear how fast Lorenzo will be on the Ducati, and will take any steps they can to slow up his process of adapting to the GP17. Yamaha expect both Rossi and new boy Maverick Viñales to be quick on the M1, but they already face Marc Márquez on the Honda. Hobbling Lorenzo will give the Movistar Yamaha riders a chance to take advantage early in the season. The less than harmonious atmosphere inside the Movistar Yamaha garage will have given Yamaha a reason not to be too generous towards Lorenzo. If the Spaniard had handled the contract negotiations a little better – and Yamaha had dealt with the tension at the end of 2015 with more tact – then perhaps Yamaha would be more inclined to allow Lorenzo to test. But he didn't, so they aren't. Of course, Yamaha are entirely within their rights to refuse Lorenzo any testing at all. By allowing him two days at Valencia, they appear generous enough, while not giving away too much. But you have to believe that the relationship between Yamaha and Lorenzo is fairly well soured. In the grand scheme of things, Yamaha's refusal will probably not make a great deal of difference. The Ducati GP16 is already a competitive bike, and the GP17 will only get better. All great MotoGP riders adapt to new bikes quickly, getting up to speed within a few days. Ducati are free to plan private tests any time they want in February, still giving them sufficient time to modify the chassis of the GP17 ahead of the season. Even without a private test, Lorenzo will line up at Qatar with eleven days of testing on the bike under his belt. He should be ready, whatever Yamaha have decided to do. Valentino Rossi is fired-up to end Yamaha's MotoGP victory drought during the three flyaway events, that start in Japan this weekend. Yamaha won five of the opening seven races courtesy of Rossi and team-mate Jorge Lorenzo, but hasn't taken a victory in the seven races since. "I love the three overseas races, these circuits are fantastic," declared Rossi, referring to the Motegi-Phillip Island-Sepang events. "On paper we are strong with the Yamaha, so I hope to fight for the victory. "I'm especially happy to go to Japan because it is the home of Yamaha and I will do my best to make it a good Grand Prix. I like the track and the atmosphere. I'm in good shape and I'm ready for the three races in a row!" While no rider gives up on a championship until the mathematics become impossible, whatever they may say in public, the huge 52-point gap to Marc Marquez combined with a 14-point difference between Rossi and Lorenzo means the fight for the runner-up spot is the only target still within their own control. MotoGP champion elect Marc Marquez is approaching this weekend's Japanese Grand Prix with a different mentality to Aragon. The Repsol Honda star, who won his first race since July in front of his home fans, technically has the chance to become a triple MotoGP champion on Sunday. However, with three more rounds remaining after this weekend, the feat is not yet in his own hands. With a 52-point lead over Valentino Rossi and 66-point advantage over the other Yamaha of Jorge Lorenzo, Marquez would not only need to win at Motegi - something he is yet to do in the premier-class - but hope Rossi finishes no higher than 15th and Lorenzo outside the top four. Given his past record at the circuit, Marquez admits he is prepared to adopt a damage limitation strategy - losing as few points as possible to the Yamaha riders this weekend. "The Japanese Grand Prix is an important appointment for us as it is Honda's home race and one where we have great memories, as we clinched the title in 2014. On the other hand, it's a circuit that has always been a bit challenging for us," Marquez said. Team-mate Dani Pedrosa is a triple MotoGP race winner at Motegi, including last year's wet race, and is currently just six points ahead of Suzuki's Maverick Vinales in the fight for fourth in the world championship. “Motegi is one of my favourite tracks, and in addition to the fact that it's Honda's home circuit, I've had good results there," he said. "Clearly, we want to get the best result possible in front of our Japanese fans, but we must arrive there and start working on the bike and the tyres to understand if we'll be able to be as competitive as we have been lately.